 ▹ It’s really fun and uplifting to keep a journal. A journal holds memories in a way that is very personal and often emotional. Do you know that much of what we know today about the natural world comes from the journal entries of naturalists and scientists? So, when you are recording and sharing observations you potentially help scientists who study directly or directly what you recorded. A Nature journal helps to deepen Nature experiences in that journaling—with the active recording of our observations—allows fixing the experience in our mind. Journaling makes us more alert to patterns and cycles over time. It is also a meditative, relaxing activity: it makes us pause and focus on details that we miss in our daily busy lives. Buy a sturdy composition book or a sketch notebook. Have some writing supplies and pencil colors handy. You can even add colored markers, pen and ink, and watercolor to your list of supplies. One key piece of advice: don’t be shy, don’t be afraid of the page(s)! It’s not about knowing how to sketch, or producing an “oeuvre d’Art”. It’s about observing, recording information and feelings, gluing our photos, illustrating/sketching what we see, experimenting with colors and shapes, as well as letting go and be creative in our own ways. ✓ First Impressions. Take a moment before starting drawing. Get a sense of the place: listen, smell, look. Look at the sky, the ground at your feet, the foreground and background of what you see at eye-level. Think about what you might expect to find: flowers, colors. Note those feelings and thoughts down. ✓ Observations. Description of a plant, an insect. The size, color, shape, what it looks like, what it resembles. What is the behavior of that insects, and what are the plants around. What is the type of habitat it lives in, etc. ✓ Pictures. Take snaps, but also draw what you see. You can make rubbings of ferns, leaves, barks but preferably only when it does involve snapping a leaf, breaking a mushroom. Always think about minimizing disturbance. ✓ Collect (but only when it is allowed and when it does not harm the habitat) a dead leaf, a weed. Only take what has fallenPress it under a heavy book for several weeks then tape or glue it into your journal and write about it. » But I Can’t Draw! 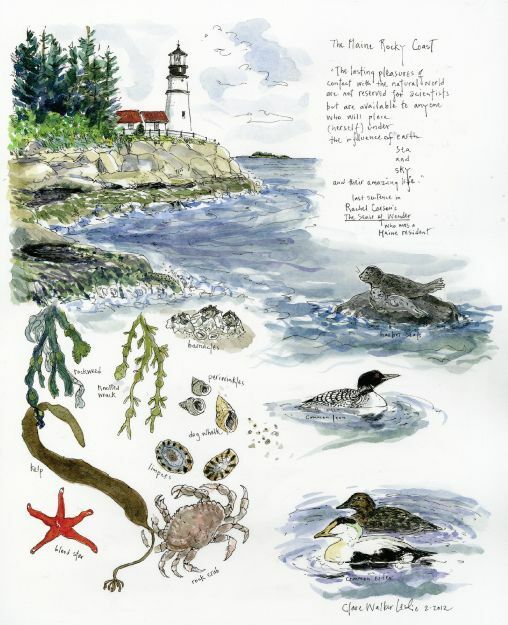 ▹ If you’re new to nature journaling and sketching, don’t be afraid. Everybody can sketch, it is about ‘seeing’ before anything else. As soon you learn to see and a few sketching tricks, then you’be all set to explore. Remember that nature journaling is about recording information in words and lines. It’s all about the observation, not the drawing per say. You’ll be surprised to see how fast actually one can learn how to set lines and shapes on a page, and then how quickly one improves! ▹ Don’t forget to be correctly equipped. Nothing is more annoying than realizing that you forgot your special pen or brush! ▹ Here are few books from Nature sketchers and observers to inspire you, and to set you up on your own personal journal journey. ▹ Finally, here are a couple of very helpful instructional videos for starters from the Oregon State University (2009). We chose Techniques for sketching birds and Techniques for wildflowers & plants in a field journal, as we think that if you grasp the basics of how to draw a moving bird, and see the basic elements of plants, then you’ll be on a good learning path. These videos help understand us the structure of what we observe and the general process of nature journaling. Check the instructor’s Channel (John Muir’s Laws ) –it’s a treasure chest filled with tips and techniques to make us better naturalists. We just love it!